The tiny country of Costa Rica contains 5% of earth’s biodiversity, a density unmatched anywhere else in the world. Her lush rainforests and coastlines are home to an abundance of mammals, amphibians and birds, including jaguars, ocelots, spider monkeys, whales, and sea turtles. At the same time, Costa Rica faces multiple threats from reckless commercial deforestation for timber, cattle pastures, and crop farming; growing pressure to open the coastlines to oil and gas drilling; and negative impacts of the rapidly growing eco-tourism trade on the Pacific Coast infrastructure. In this small, bilingual photo-essay, readers meet young Fernando Vanegas, who lives with his family deep inside the lush tropical rainforest. While his mother works at home and his father tends crops, plants trees, and teaches people about the rainforest, Fernando and his friends go to school, pick bananas off the trees, and swim and fish nearby. When Fernando and his friend, Carmina, discover that her favorite climbing tree—a very old cristobal—has been chopped down, Fernando presents her with a small cristobal from his father’s nursery, and the two plant it in a secret spot where it will be safe. 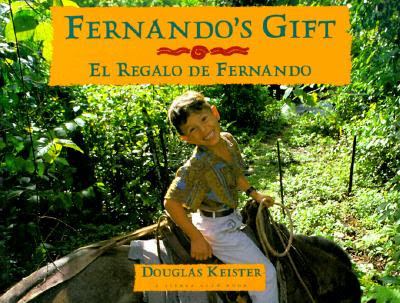 Although Fernando’s Gift will give young readers a small indication about what it’s like to live in the rainforest, the photos are pretentiously staged and manipulated, and the text—a child’s narrative—is embarrassingly unrealistic. In each of the photos, for instance—even those of Papá milking the cow and doing farm labor, and of Fernando and Carmina fishing for trout—everyone’s clothes is immaculately clean and pressed. There’s not a speck of dirt to be seen, not even on young Carmina’s pristine white tennis shoes and white socks. No dirt under the fingernails, not a hair out of place. Wouldn’t someone know that, when you live in the countryside, you get dirty? In addition, the text and photos are mismatched. For instance, there’s a photo of Mamá giving baby sister, Evelyn, a bath. A few pages later, little Evelyn is shown sitting close to Mamá, who is chopping onions. The text reads: “When it’s time for breakfast, my father milks the cow, and my mother and Evelyn chop onions to flavor our meal.” But Mamá and Evelyn are not chopping onions together! Evelyn is a baby! Grandfather explains that people have been cutting down trees in the rain forest for many years. Often they don’t understand the harm they are doing. He tells us that when trees are cut down, animals no longer have a place to live. Trees also help to keep the soil from washing away. Grandfather says that this is why my father’s job planting trees and teaching people about the rain forest is so important. It’s apparent that the author wrote this story first—as a “child’s” narrative—and then staged photos to illustrate it. Finally, the Spanish translations are constructed in such a literal manner as to allow English-speaking readers (and their teachers) to follow the English text word-for-word. For English speakers this might be seen as a plus; but for Spanish speakers, it is confusing and off-putting.